This was an unplanned recipe for this holiday and I picked it for two reasons. Number one that we are going on a serious health kick after the holidays and cake is banned (unless I'm baking it for someone else) and I've never made a traditional Vicky sponge before; and number two because I wanted to try out Stork Baking Liquid. This post is not sponsored in any way by the makers of Stork. I wanted to try it as it saves having to remember to get the butter out of the fridge when you have a baking emergency. Since having Miss A I only use butter or pure oil in cake because of the manufactured chemical history of margerine so this is a bit of a side step for me. 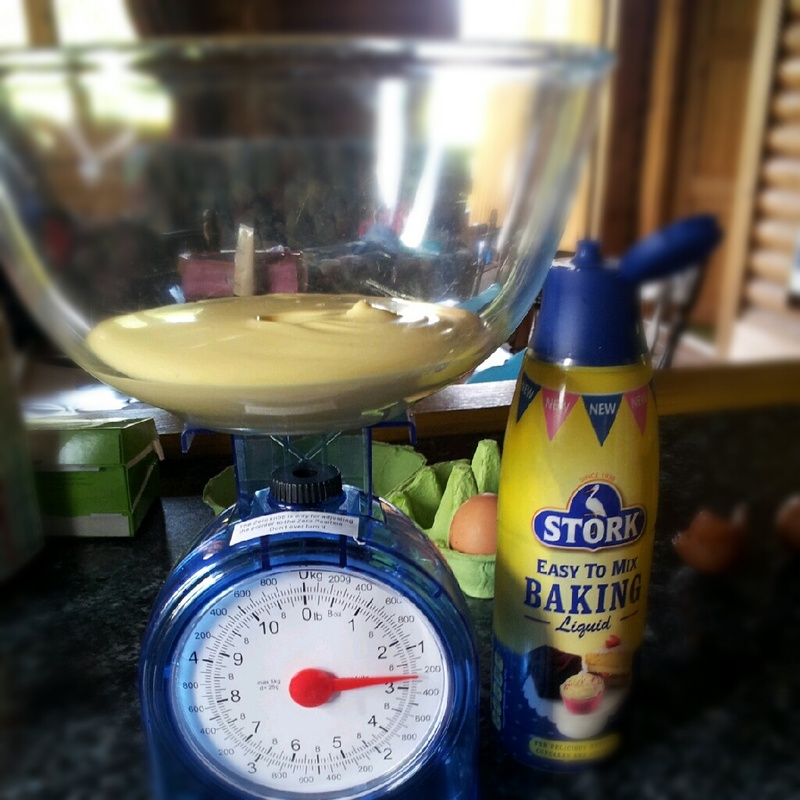 As we're on holiday without a mixer it seemed like a simple way to make a cake without too much beating. As I'm typing from my phone whilst hubby is driving through the sodden Highlands, I will keep this short and update when we're home. The bake was very yellow compared to a butter- or margerine-based cake. The sponge was much damper on the bottom than I would've expected - more what I'd expect from an oil-based recipe (like a carrot cake). However it was lovely and light and tasted good (thanks to some expensive vanilla bean paste) with a moist crumb. It is a good store-cupboard stand by, however, I much prefer Dan Lepard's method of just using semi-melted butter. Over the course of this blog, I've tried loads of ways to quickly soften butter. One involves pouring boiling water into a pyrex bowl then removing the water, and placing the butter under the inverted bowl to let it soften. Didn't work. I've left it on the radiator in mid-winter only to forget it until I found the spaniel lapping at a suspicious yellow puddle on the kitchen floor. Grating it works to some degree - the heat from your hand whilst grating helps even more, but if you're using a lot of grated butter in cold weather, it just reverts back to a uniform ball of butter. But since hearing of Dan's method of having roughly 60% solid to 40% liquid butter - which you can do by microwaving it on medium (and watching it like a hawk), I've managed to get around the problem of remembering to take my butter out in advance of making a sponge cake. In fact, I guess it's just like using this oil-based product but with a better colour and flavour. As for my opinion of Ms Berry's recipe? 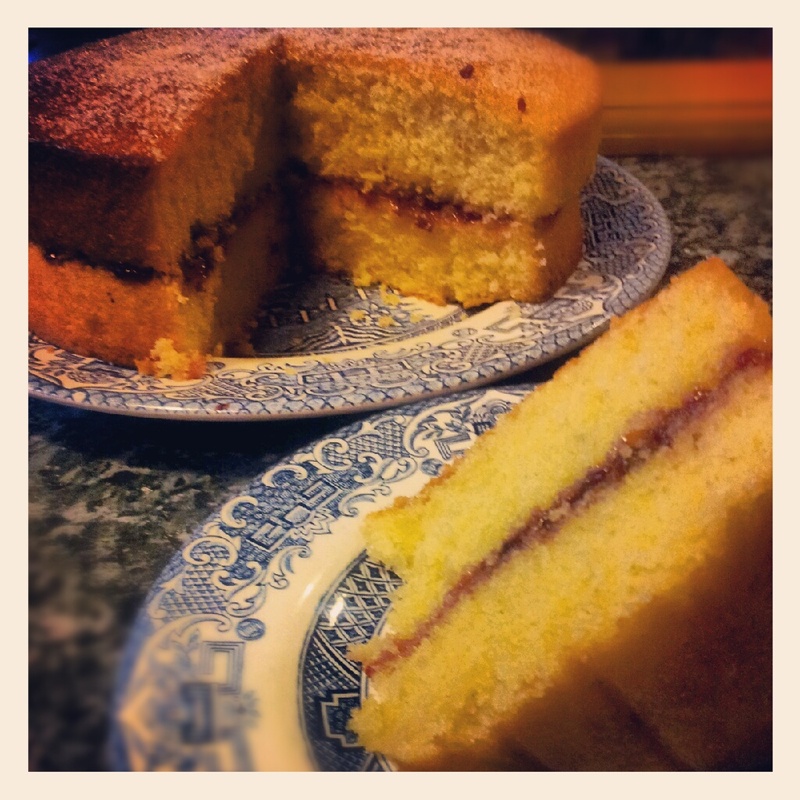 Well its a standard sponge recipe with even quantities of ingredients making it simple to scale. And its one the WI would approve of as its only filled with jam and doesn't have cream. I've heard they disapprove of anyone other than the gorgeous James Martin doing that. I used her recipe from 100 Bakes and Cakes, but there are loads of variations she's penned all over the web. This is the version from the Telegraph which uses the same quantities as the book.